This 48 hour slow food recipe is a set and forget kind of dish, apart from maybe the last 15 minutes of “pulling” and prepping. 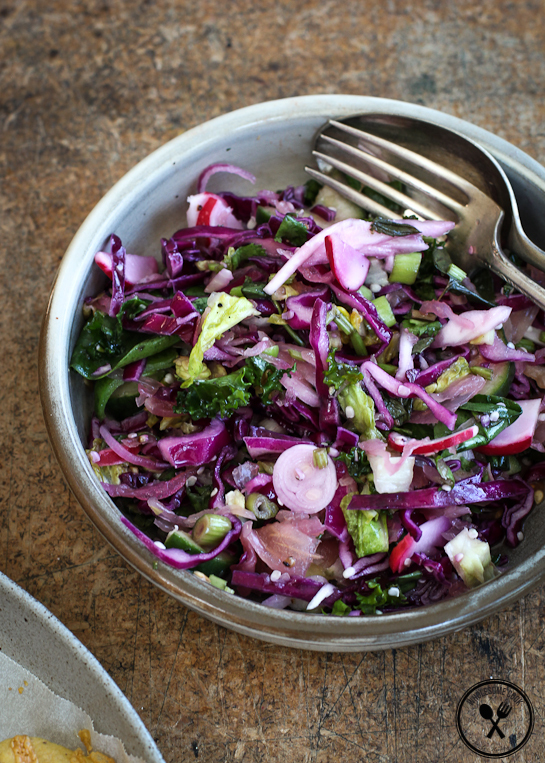 As for the slaw – it’s like my Fridge Surprise Slaw but supercharged. Just like the main dish is a little flavour surprise combining lamb, cheese and cornchips in an unusual but tasty combo, the Super Slaw packs big flavour and is a nutrient bomb! Best for sharing with friends. 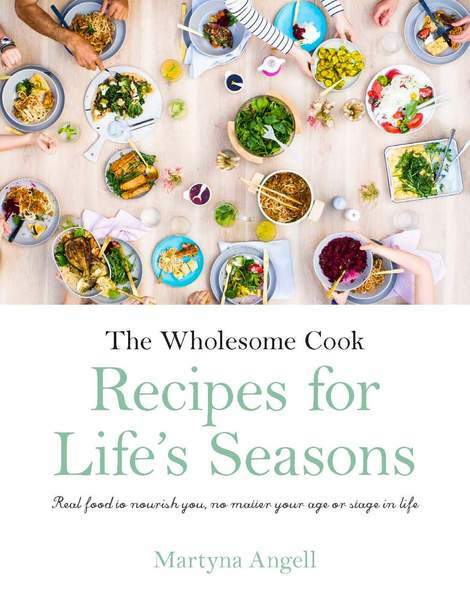 If you’ve ever had a sneak peek at my About section and read the 25 things about Wholesome Cook and I, you probably already know that I wake up thinking about food. I cook it. I eat it. Then at night I even dream of it! Most days during the week I’m cooking for clients, yet most nights I still love preparing a special meal for my family and friends. 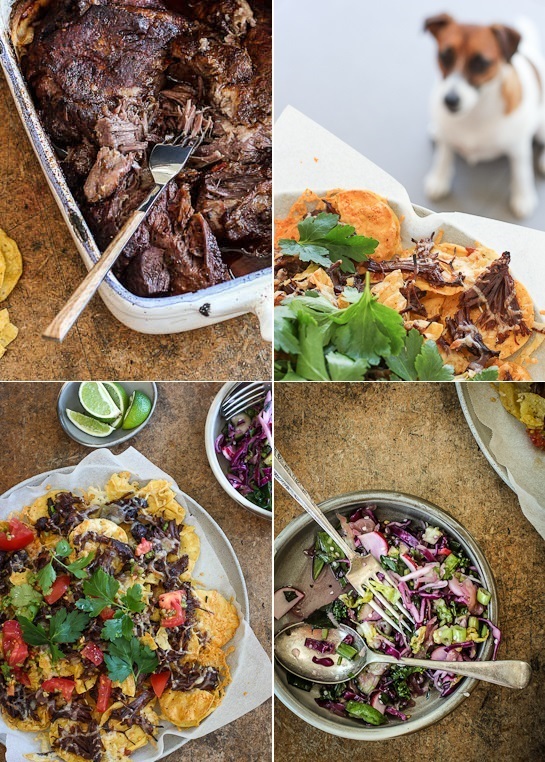 I find creating new food experiences – like this unusual combination of slow cooked lamb shoulder with nachos, extremely satisfying, and to be honest friends and family make for a great and honest taste-testing audience. Speaking of friends, two of our close friends have recently made the sea change decision to move to the Southern Highlands. With only a few weeks left in the big smoke, we caught up last weekend to hear more about how the opportunity came into light and their plans for the time there. 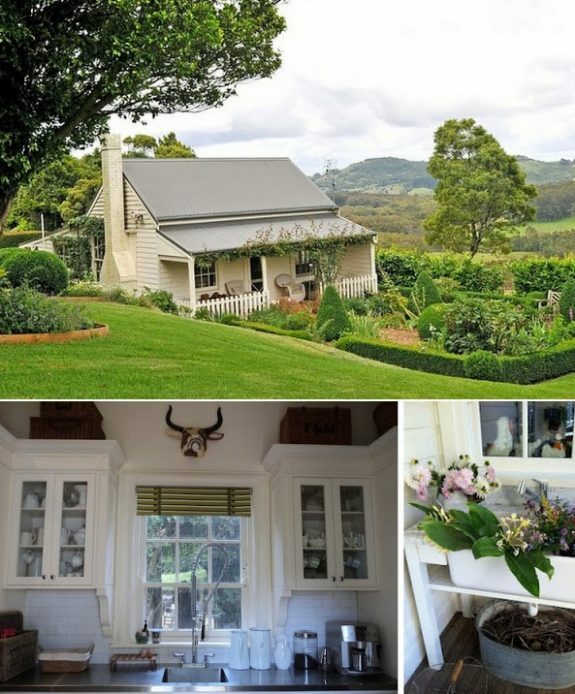 They will be managing a beautiful and almost fully self-sustainable property, growing their own vegetables and looking after a small flock of farm animals. Their enthusiasm for this whole new world lies somewhere between Aussie Gourmet Farmer‘s Matthew Evans‘s and River Cottage‘s Hugh Fearnley-Whittingstall‘s. They will have apple orchards to tend to and chooks to look after and they are even talking about having some goats and sheep really amazing! They have inspired me to re-invigorate our small vege garden in time for summer. But before we get there, mid-spring is here and what a fantastic time for late afternoon soirees. It is warm enough to be outside without the uncomfortably humid and sticky feeling that comes in the summer months. It is also the prime time for spring lamb – one of the cleanest and most sustainable meat choices out there, even when not buying organic. This 48 hour slow food recipe is a set and forget kind of dish, apart from maybe the last 15 minutes of “pulling” and prepping. 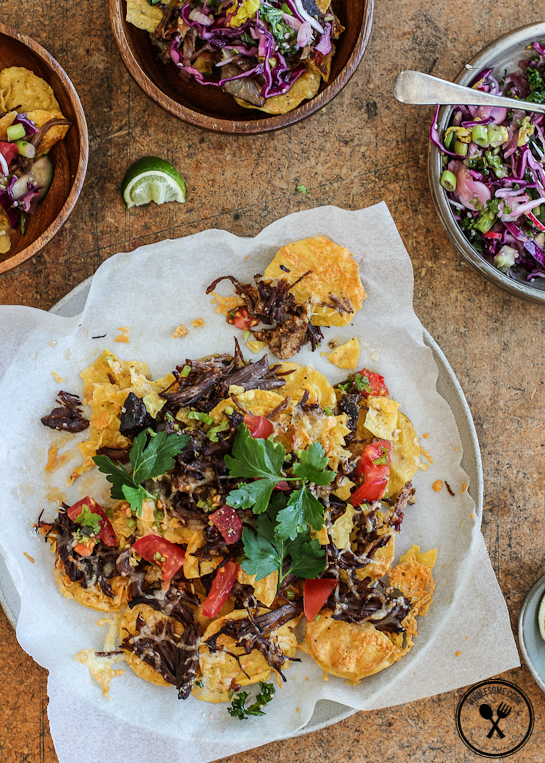 Dishes like these Lamb Shoulder Nachos are perfect for sharing with friends. Simplicity of preparation for such occasions is key, wouldn’t you agree? As for the slaw – it’s like my Fridge Surprise Slaw but supercharged. Just like the main dish is a little flavour surprise combining lamb, cheese and cornchips in an unusual but tasty combo, the Super Slaw packs big flavour and is a nutrient bomb! There is no rule on what to include or omit really, except for one: ferments. Sauerkraut and brine pickles – yes the kind that requires no vinegar, just salt and water. They are extremely beneficial for the gut. My ferment brands of choice are Krakus for kraut and Eskal for pickles. And who knows, perhaps, I will be able to make my own pickles if the vege patch takes off this year. That would be splendid! So, tell me, have you ever considered a sea change like this? What about growing your own produce or keeping farm animals? And what other super ingredients would you add to the slaw? This 48 hour slow food recipe is a set and forget kind of dish, apart from maybe the last 15 minutes of “pulling” and prepping. Use organic lamb and cornchips if you can. Cooked shredded meat can be stored in the fridge for 3-4 days and frozen in portions for 2 months.It is recommended to start this recipe 2 days ahead for the flavours to develop, but not necessary. If stuck for time, allow for 2-8 hours for the dry rub to infuse. Wash the lamb shoulder thoroughly and pat dry with paper towels. Mix all the spices in a small bowl and sprinkle evenly all over the lamb. Rub the spice mix well into the meat, top and bottom. Place on a large plate and cover with cling film. Pierce a couple of holes in the film for the meat to be able to breathe, Store on the bottom shelf of the fridge. Preheat oven to 180C (160C fan-forced, 350F, gas mark 4). Line a roasting tray with baking paper. Mix Arrabiata sauce with beer. Place lamb shoulder flat on the paper and pour over the sauce. Cover the dish with foil and cook for for 3-4 hours, checking the meat halfway through and adding some water if necessary. When ready, remove from oven and shred or “pull” the meat apart with a fork. Transfer to an airtight container but allow to cool to room temperature before placing the lid (store in the fridge if not using straight away). Preheat your oven grill to medium-high. Spread a layer of cornchips on a baking tray and top with a handful of cheese. Place under the grill for 2-3 minutes. Remove and top with shredded lamb, any leftover cornchips and cheese. Grill for a further 5 or so minutes until the cheese is melted and cornchips golden. Serve with diced tomato mixed with diced coriander stems, and lots of coriander or parsley leaves. Lime wedges on the side. This dish goes really well with the Super Slaw (next recipe). Similar to Fridge Surprise slaw in that anything goes, but there is one rule: this one includes fermets such as sauerkraut and brine pickles. I encourage you to try adding these in, even if you don’t like the flavour on its own. It kind of blends in perfectly in to this dish and is great for your gut health. There is no strict rules as to the amount of things added, so handfuls work most of the time. Shred or julienne all ingredients and mix them in a large bowl. Shake dressing ingredients together and pour over the salad. Mix well and serve. I love the idea of lamb nachos! So very original. As far as the slaw is concerned. It’s perfect just the way it is :). Very original idea indeed! I’ll give them a shot with GF beer. Lamb nachos sound wonderful and look amazing! Your friends lifestyle sounds idyllic but I’ll bet it’s going to be hard work. Wow talk about a lot of work to upgrade simple nachos, and it looks well worth it! 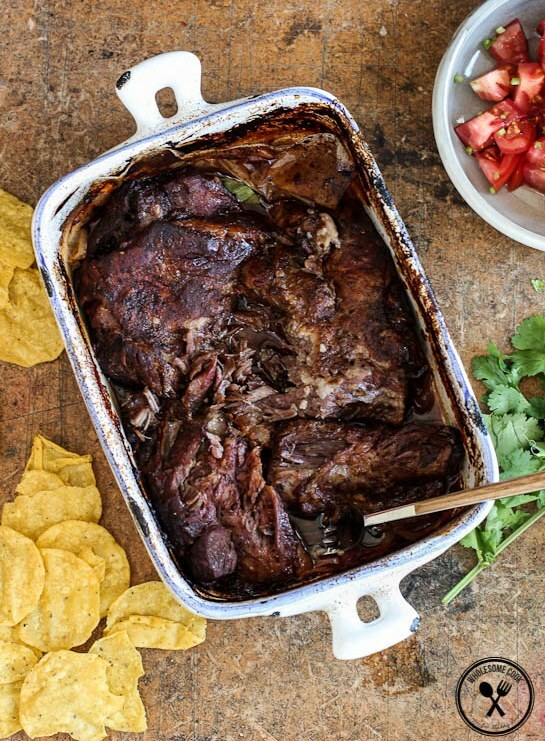 I’m a huge fan of lamb so I can only imagine how tasty slow cooked lamb on nachos would be. Your slaw recipe is also amazing – I think I can eat that just as a salad! Hi Christine, it’s actually not that bad. Most of the steps take literally a few minutes of actual work. The rest is time. As for the slaw, I happily eat that on its own too – with large amounts like this there is always leftovers. And I actually find it quite refreshing for breakfast in warmer weather. The super combo meal as I would say. Can’t forget the first time I tried this delicious meal, feels like I was truly in paradise. Oh I love this!!! Even the slaw looks super special, I will have to pin it and give the recipe a go! OMG! my mouth is watering. I am on a Intermittent Fast Diet (24 hr fast twice a week). So when I can’t eat I troll the internet looking at recipes, believe or not this helps. I am definitely buying your cook book. This super slaw looks like it can be eaten as a salad. Can’t wait. And the Sour Kraut Stew/Meat and the Lamb shanks with Yorkshire puddings…yummmmmm! And a lot of other wonderful things. So glad I found your site! Wonderful.